This 16-year-old hails from Kolhapur, Maharashtra. He is going to be one of the youngest participants at the Beijing Olympic Games. He was the first and the youngest-ever Indian swimmer to qualify for the Beijing Olympic Games. He has gone faster than the Olympic Qualifying time in three events - 50, 100 and 200m Freestyle - becoming the first Indian to do so. He currently holds the National record in five events - 50, 100, 200 and 400m Freestyle and 50m Butterfly. His time in the 50m Freestyle is currently tied-fastest time in Asia this year. His highest world rank this year is 85 in the 50m Freestyle. In India, he trains at the K.C. Reddy Swim Center, Bangalore under Coach Nihar Ameen. Virdhawal is being funded by the Mittal Champions Trust and the Ministry of Youth Affairs and Sports through their National Sports Development Fund. He is also the first Brand Ambassador for SPEEDO in India. This 19-year-old hails from New Delhi. He is pursuing a Bachelors Degree in Arts from St. Stephen's College, Delhi. He is the first Indian Breaststroke swimmer to qualify for an Olympic Games. He is the National Champion and National Record holder in the 50, 100 and 200m Breaststroke. In 2008, he reached the highest world rank of 144 in the 50m and 200m Breaststroke. Sandeep is funded by the Ministry of Youth Affairs and Sports through their National Sports Development Fund. 21-year-old Ankur Poseria trains and studies at the University of Southern California, USA where he is pursuing a Bachelors Degree in International Relations. Ankur currently holds the National Record in the 100m Butterfly. 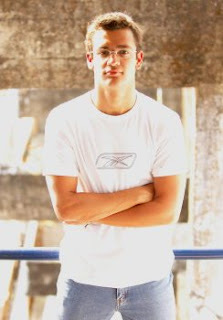 In 2008, he reached the highest world rank of 107 in the 50m Freestyle. He trains under Coach Dave Salo, a highly reputed US coach. This 22-year-old is the oldest amongst the four and was the last to hop on the flight to Beijing. He has been based in Bangalore for over a decade and is pursuing his Degree (BA in Psychology and Journalism) at Sri Bhagawan Mahaveer Jain College, Bangalore. He is the National Record holder in the 200 and 400m IM, 200m Backstroke and 200m Butterfly. 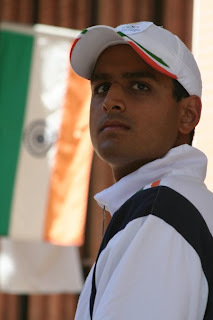 In India, he trains at the Basavangudi Aquatic Center, Bangalore under Coach Pradeep Kumar.